Win a gold spaceship on all games. Win at least a silver spaceship on all games. Bounce a Deviant 1,500 times. Win at least a bronze spaceship on all games. Win your first bronze spaceship. 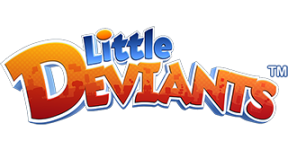 Use each of the PlayStation®Vita system's input devices that are featured in Little Deviants. Win your first gold spaceship. Unlock Twisty Root Grove region. Post a score to the online leaderboard. Defeat a challenge from a PlayStation®Network friend. Complete Rolling Pastures with full health at the end of the game. Score over 35,000 points in Shack Shover without hitting a Whoman or a Deviant. Complete Corridor Caper without using any EMP pickups. Boost through all the rings in any single stage of Cloud Rush. Complete Hot Air Hero without patching the balloon once. Splat 6 or more Dead 'Uns with one shot in Rotten Rumble. Destroy 2 or more Dead 'Uns with one fire attack in Corridor Calamity. Play Rolling Horror between 00:00 and 01:00. Boost 5 times in a row without crashing in Death Speeder. Destroy 10 Botz without missing a shot in a game of Botz Invasion. Score at least 28,000 points in Chalet Shover without using any Clock pickups. Pick up the Star from the secret chamber in Risky Rambler. Hit at least 10 different wind vortices in Depth Dive and still complete the game. Complete Depth Charge without hitting any walls. Complete Botz Blast without wiping any green goo from the screen. Collect at least 120 pickups in a single game of Risky Trails. Complete Aqua Speeder without picking up more than 20 Stars. Break open a crate in under half a second in Rolling Shores. Jump on one platform 5 times in Bouncer Trouncer. Finish Stage 4 of Depth Avenger with at least 10 seconds remaining. Hold a note in Smashing Tune for at least 5 seconds. In City Shover hit all 12 Number-Botz in sequence. Collect 3 bird pickups in a single game of Tower of Boing. Complete Stage 1 of Risky Inclination with at least 30 seconds remaining. Boost over the finishing line in Street Speeder. Complete Neutron Nudger without any Botz damaging the energy sphere. Complete Manic Melter by only twisting the platform clockwise. Smash 5 frozen Botz or more in a game of Corridor Complications. Destroy 20 Botz in Destructor Constructor. Input 3 consecutive codes correctly in Cannon Codes.